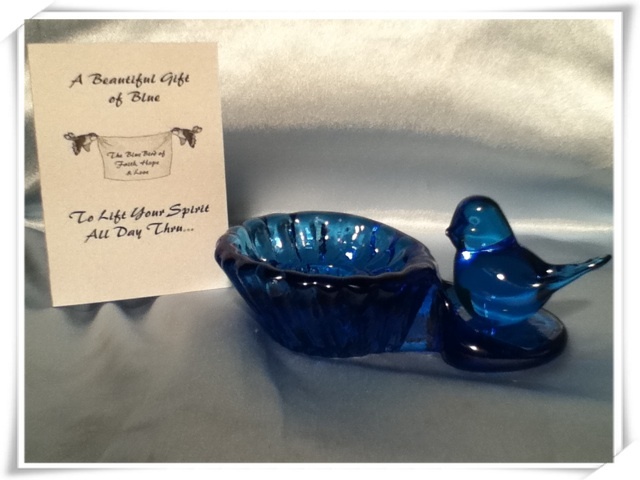 This Beautiful Glass Stick Candle Holder with Baby Blue Bird was handcrafted while the glass was molten and pliable (around 1,800 degrees) on the end of a steel rod. Hand held tools were used to shape the glass into the form of this Beautiful Bluebird. Each Bird is Handmade, making each one unique. The Mythology of the Bluebird has deep roots that go back thousands of years. Indigenous Cultures across the globe hold similar beliefs about the Bluebird. It is a widely accepted symbol of Cheerfulness, Happiness, Prosperity, Hearth, & Home, Good Health, New Births, The Renewal of Spring, etc. Virtually any Positive Sentiments may be attached to the Bluebird. Each Stick Candle Holder with Baby Blue Bird comes with an Inspirational Gift Card which makes it a perfect gift to brighten anyones day. Dimensions: 5" L x 3" W x 2" H Weight: 10oz.